When someone we love dies, and we think about their lives, we often think about the life in terms of us. It’s not really all about me, but we have memories that are ours and that’s what we remember. So forgive what’s all about me and share in my loss. When we were kids, me and my cousins lived pretty close together—geographically. We all lived not five blocks away from each other. And our parents expected we would bond [as they had done growing up in the 20s and 30s]. But we were 10, 6, 3 years apart so we always had different priorities. Larry always had the best stuff. Clothes, toys, and cars. His cars were amazing. 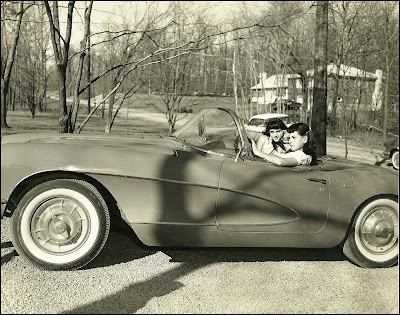 Always a Corvette or some other incredibly hot vehicle which no woman could resist. There was one day when Stevie and I were in Hebrew School, and Stevie put a pencil under my tush as I sat down. It broke off and I had to go to the doctor. For whatever reason, the Rabbi was unable to reach anyone but Larry. He took me to the doctor, but made me sit on my knees. Not so the pencil wouldn’t go deeper, but because he didn’t want me to bleed on the car’s upolstery. I don’t want to minimize the loss the family has suffered with anyone. Larry, however was such an important part of my life – he could decide if we lived or died -- that the fact that as adults, we got to know one another and actually like “us” as adults was incredibly special.